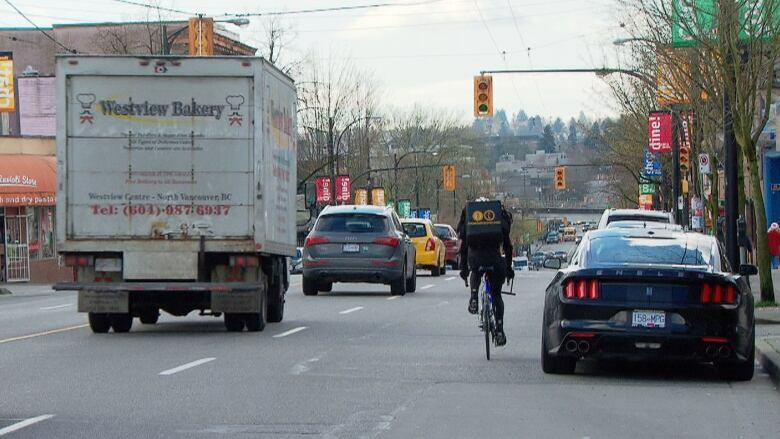 The Commercial Drive BIA says a survey it recently sent out to its members revealed 84 per cent of those who responded don't support a proposed bike lane on the busy street. The City of Vancouver's plans to build a bike lane on Commercial Drive is irking businesses along the busy shopping and eating area. The lane, which is slated to run between First and 14th avenues, was one of 12 the city approved in December to be built in the next five years. "I'm concerned. I'm really concerned," said business owner Lena Demetrioff. "If you see Commercial Drive and how tight the street can actually be — even the buses have a hard time with parking and pedestrians." According to the Commercial Drive Business Improvement Society, Demetrioff isn't the only shop owner concerned about the new bike lane. It says a survey it recently sent out to its 650 members revealed 84 per cent of those who responded don't support it. "The loss of parking could have an adverse effect on the economic viability of businesses on the drive," said the society's CEO, Nick Pogor. Pogor says the city should consider moving the lane to a nearby residential street instead. But environmentally-friendly transportation advocate Streets for Everyone disagrees. The group says it knows of 25 businesses that are in favour of the lane. And it has a petition of 3,000 community members who are also on board. "Nearly 20 per cent of Grandview-Woodlands needs or uses their bike to do errands, spend money, to go to different services, and they're not being accommodated on the street," said Alex Thumm with the organization. And many cyclists in the area say the lane will enhance business, not hinder it. "Cyclists are consumers too and customers of businesses, and you can fit more bikes in front of a business than cars," said cyclist Jordan Bober. The city says it's aware that not everyone agrees, but the bike lane is needed for safety. "Commercial Drive has particularly high cycling collision rates, so we do want to implement some changes," said Lon LaClaire, the city's acting director of Transportation. The city says it will consult with businesses and cyclists before it makes the final decision on where exactly the lane will go.